brisbane to cairns & everything in between!! If you’d love to watch a video of our Full itinerary instead of reading, you can do that right here!!! At approximately 350,000km2 in size and stretching 2,300km along the Queensland coast, the Great Barrier Reef is the only living structure on earth that can be seen from outer space and the first coral reef eco system in the world to be awarded World Heritage status. Pretty cool hey. The Great Barrier Reef offers experiences from every angle – underwater, above water, in the air, or on the land..
A 4 hour drive to arrive in the beautiful Bargara. 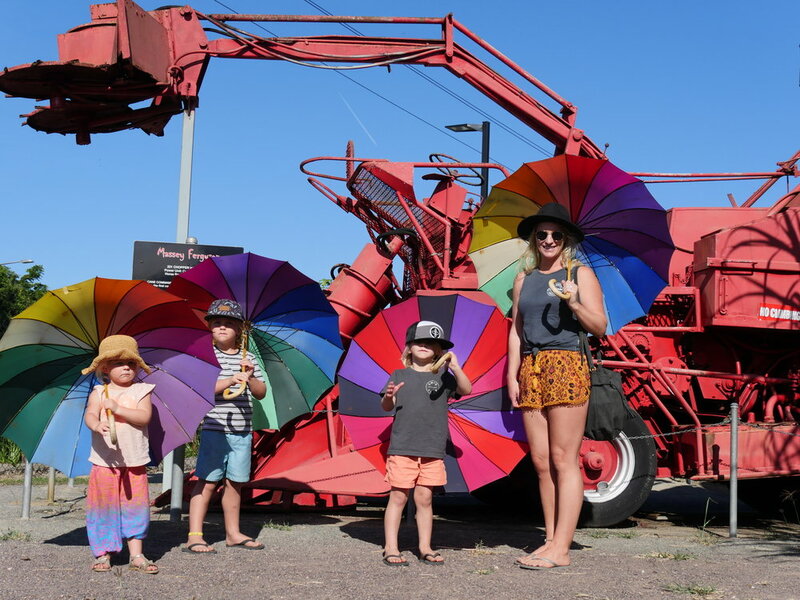 A gorgeous seaside town located 17 kilometres from Bundaberg where you’ll be driving through lush fields of sugarcane. A relaxed community suitable for young families with a Surf Life Saving Club, skate park, playground and an excellent boardwalk across from the Bargara Beach Caravan Park. An early start to make our way to Bundaberg Marina at Burnett Heads (only a 15 minute drive) where we board this 27 metre luxury catamaran. This tour offers an unreal experience to explore Lady Musgrave Island and the Southern Great Barrier Reef. 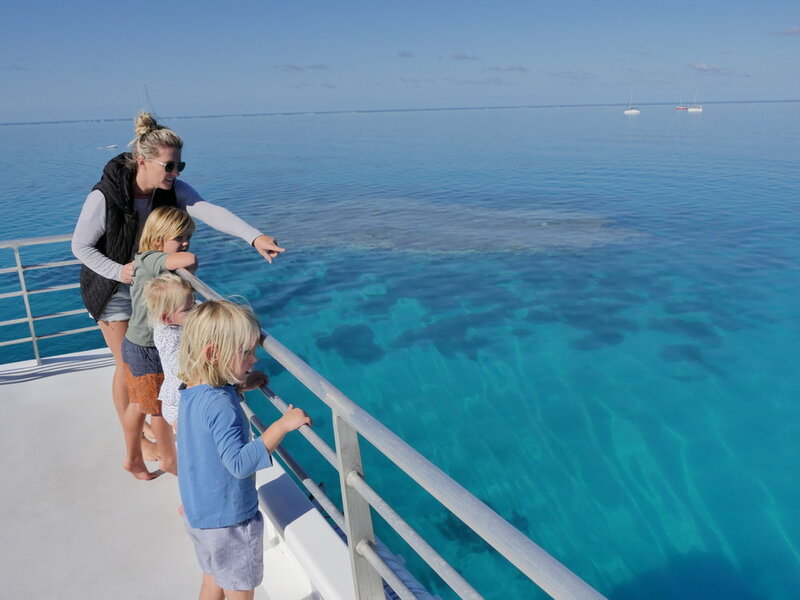 The trip out is around 2 hours where you’ll be served up a delicious morning tea to then immerse yourself in the history and beauty of Lady Musgrave and the lagoon within the reef. A fantastic time on board a glass bottom boat which the kids loved. Seeing plenty of fish species and turtles, it was fantastic education for them also! School excursion ticked off. A walk around the island discussing its history and we were back on the catamaran for lunch (which was yum). We spent the rest of the afternoon immersed in stunning blue water and snorkelling the reef. We stumbled upon a reef shark, numerous coral fish and plenty of turtles. 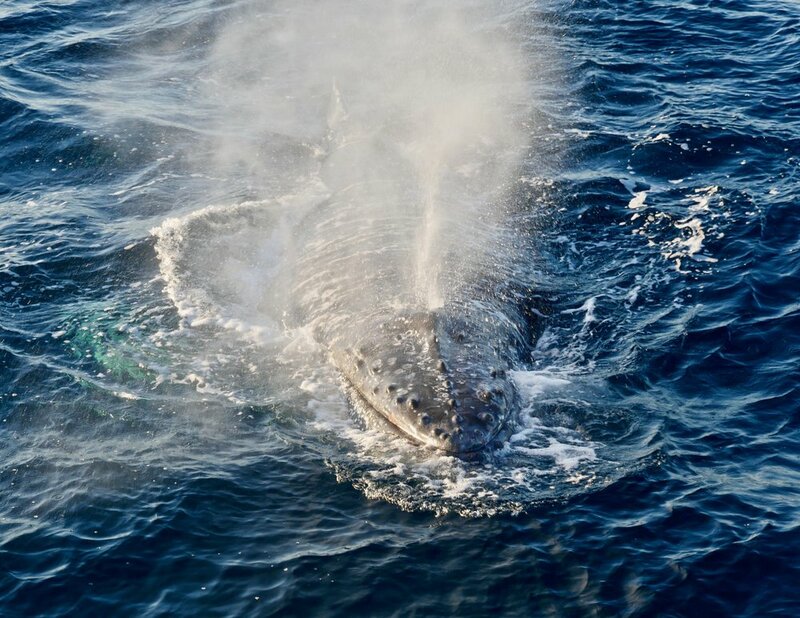 Our day capped off with a Humpback Whale encounter so close to the boat, we was glad we were on board! Up close encounter with a Whale. Another night in Bargara Beach, a coffee over the road at the Bundaberg SLSC and we hit the road. Bundaberg to Agnes Water & The Town Of 1770. This beachside town has a real vibe about it and a wonderful holiday destination. 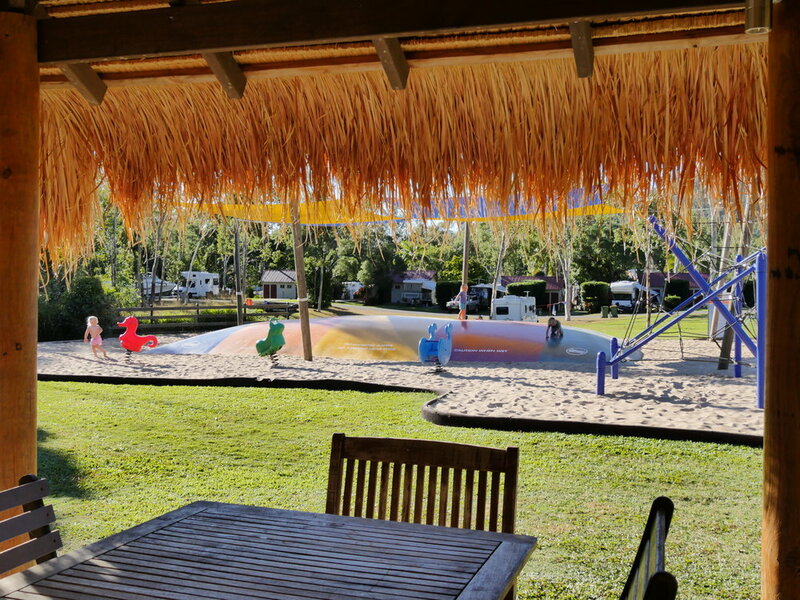 We park up at the gorgeous Agnes Water Beach Holiday Park, situated right on the surf beach. A cafe on site and only a 2 minute drive to the magical Paperbark Forest Boardwalk in the Reedy Creek Reserve. The 400m walkway consists of stepping stones and wooden walkways which are reminiscent of an enchanted forest. The kids loved exploring here and us parents love to see their happy faces. After a swim at the beach, we dried off and headed for 1770. We jumped aboard a LARC (Lighter Amphibious Resupply Craft/Cargo) with 1170LARC! and set off for a sunset amphibious tour. Absolutely amazing to see the stunning sunset and historical facts of 1770. Sunset on board the 1770LARC! A 3.5 hour drive with a turn onto the scenic route from Rockhampton through to Emu Park with fantastic views of the coastline. We arrive at Discovery Parks Coolwaters Yeppoon in Kinka Beach and WOW! A park with excellent kids facilities, they don't want to leave. A splash park, water slides, jumping pillow, pool and playground, our kids loved it here, as did we! After loads of fun at the caravan park, we head into Yeppoon to explore the Lagoon! A fantastic place to talk a dip with amazing ocean view and an infinity pool. A cafe on site and beautiful palm trees make for a tropical setting. Just a short walk away is a splash park and large playground. Such a family friendly town and we cherished our time here! The following day, Justin woke up before sunrise to witness Yeppoon in all its glory. A short hike up to Double head in Rosslyn Bay made for a great start to the day and one of the most epic sunrises! A travel day of 4.5 hours, so we head off early. A stop for lunch at the gorgeous Clairview and a play on the beach. When driving in to Mackay about 15km south is the quaint town of Sarina. We stop here to check out the Sarina Sugar Shed. An informative tour about how sugar is made from sugar cane and history of the industry. After a long drive, we were game taking the kids here. Not ideal for little ones under the age of 5, however they were very happy with the taste testings and a stick of fairy floss to finish off the tour. After a long day we arrive at My Cow Accomodation where we park our caravan and throw a line into the adjacent river. 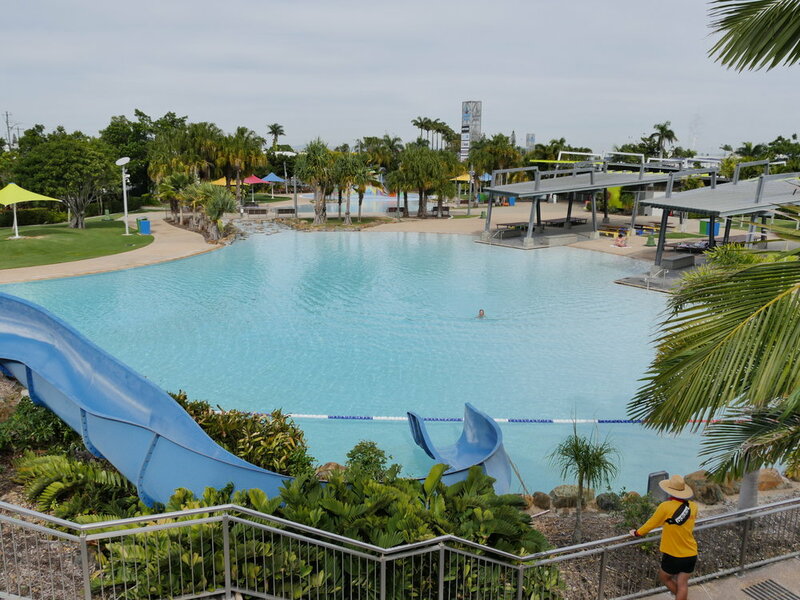 The following morning was spent at the free lagoon in Mackay called Bluewater Lagoon which is situated on the promanade and had an excellent park beside it. 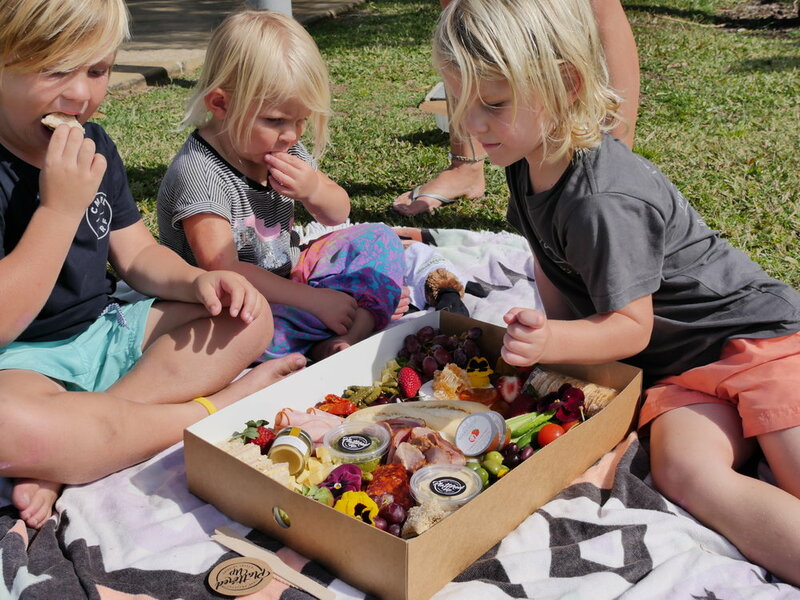 After loads of swimming and making the most of the warm morning, we ventured to the park and feasted on THE most delicious platter from Plattered Up. Cheeses, meats, fruit, bread and biscuits - we ate ourselves sick. Highly recommend doing this as its an easy way to keep the family happy with full tummies. 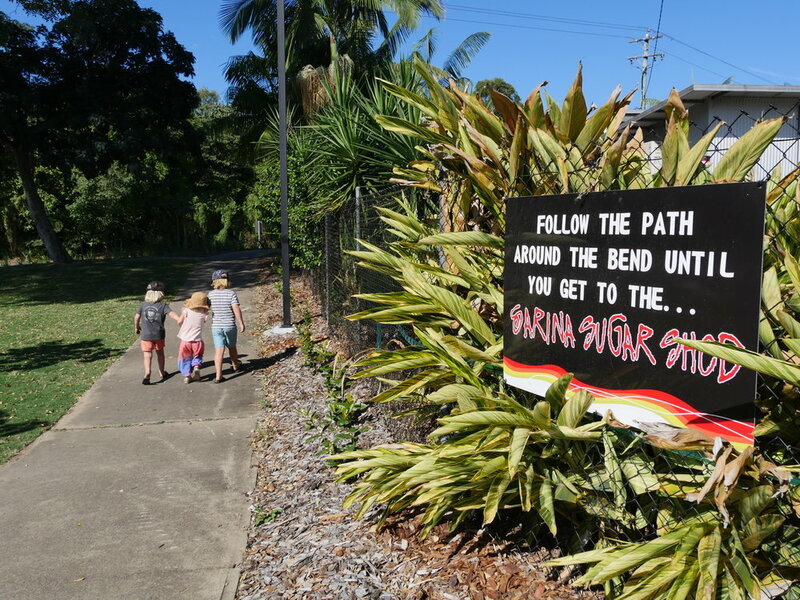 With our taste buds tantalised we made tracks for Eungella National Park. An hours drive and the last 4km very steep and winding, we arrived at the gorgeous Broken River Bush Camp. A beautiful setting with lush green hills and roaming cows, we set up alongside the river and bask in natures finest. When exploring this National Park, Araluen Falls is a must! 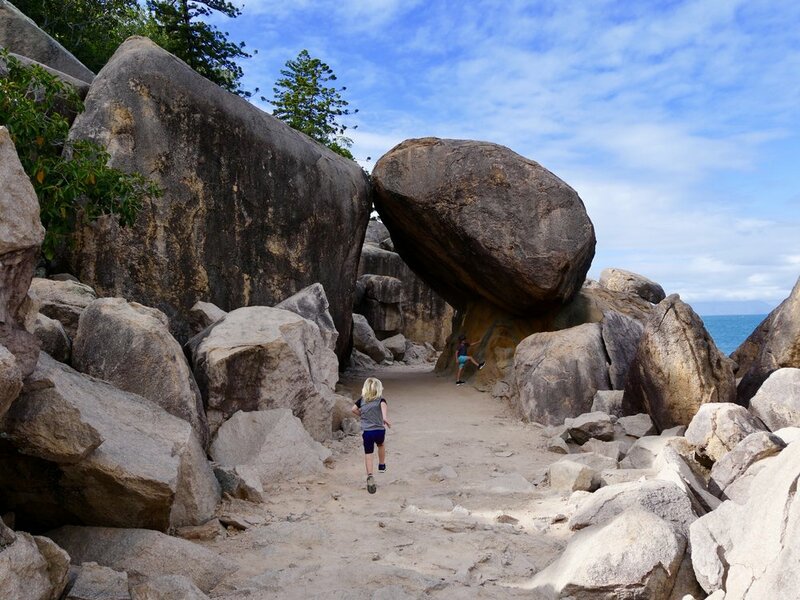 The trek in is an easy 1.6km walk to arrive at the stunning scenery and falls. A refreshing swim will have you energised and ready for the walk back. Back to Broken River Bush Camp to find us some Platypus. Well known in the area for this cute mammal, you’re very likely to spot one! After taking off on a short walk with viewing platforms we found several and kept our kids occupied for some time! A wonderful day ended with a campfire beside our caravan and and some tasty marshmallows! Platypus Lodge Restaurant and Cafe is a FANTASTIC brekky when visiting or staying in Eungella. It offers the ultimate rainforest alfresco dining expereience. The quirky cafe houses loads of kids activities and Oskar, the gentleman who runs it is a real character! He also serves up the best food!! 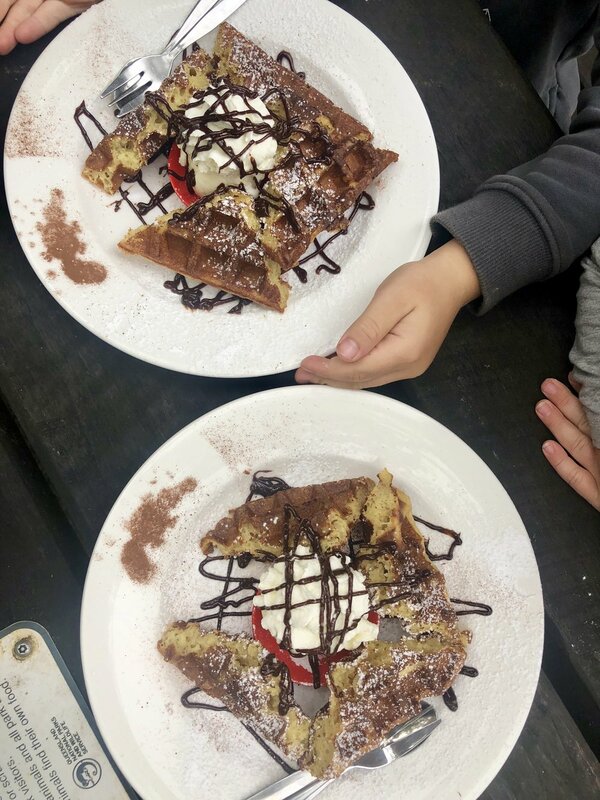 We can definitely recommend the Waffles and the Steak Eggs Benny. Excellent morning for breakfast! Off to the Pioneer Valley Show - which is widely regarded as the best one day show in Australia. 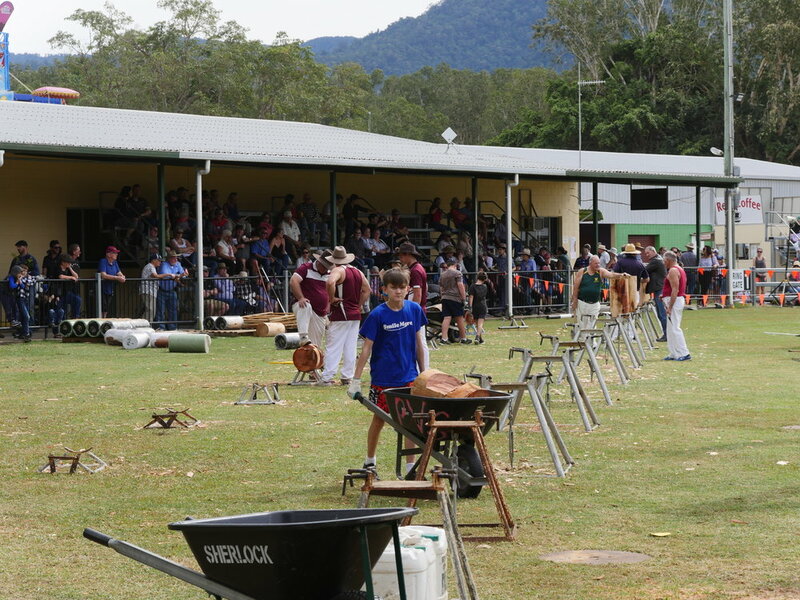 It attracts approx 16,000 people every year and this country orientated family fun day is a real treat! 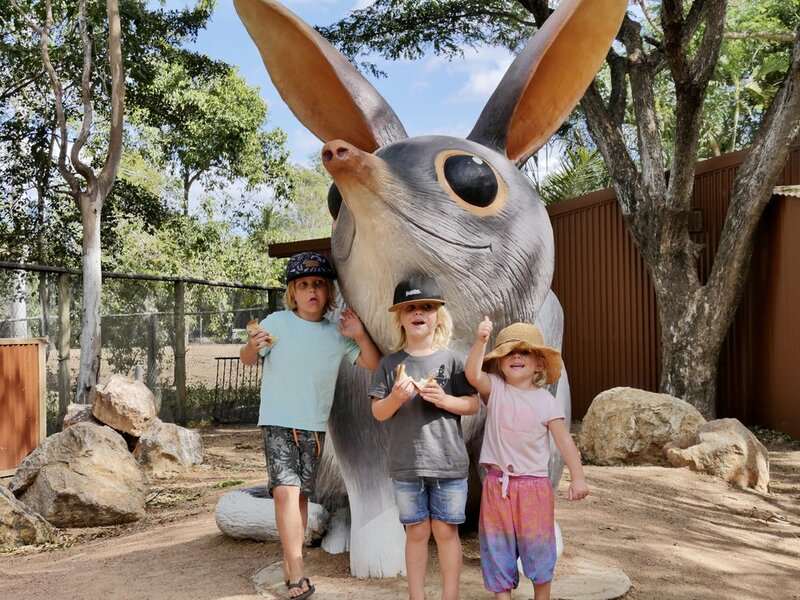 The kids were beside themselves when we entered and it was sensory overload, after a few rides, a showbag and lots of laughter, it was time to head back to Mackay. We set up at BIG4 Blacks Beach with amazing ocean views, large site, splash park and pool. We meet plenty of other travelling families and we cracked a cold one to watch the sunset. A perfect way to end the day. Justin was up early to head out with Inshore Fishing Mackay guided by Jason who has 25 years local experience. Located in Australia's premier recreational fishing destination, the charter offers you an experience to explore waterways and dams on board a 460 Renegade. He came home with some Barramundi and Blue Salmon, and they tasted delicious! Only 45 minute drive to arrive in Cape Hillsborough where dense rainforest meets the ocean. Volcanic rock and ambience set upon its native beauty make it a star attraction. Plenty of walking trails and lookout, but Cape Hillsborough is best known for its Sunrise with Wallabies Experience. An iconic wildlife opportunity to see them up nice and close feeding on mangrove sea pods. A truly magical moment with the sun coming up in between the islands and the silhouette of a wallaby or kangaroo. We think thats pretty Aussie! When exploring Cape Hillsborough, be sure to take a dip in one of the many Coral Rock Pool. Only accessible during low tide. A fantastic place to set up for the night at Cape Hillsborough Nature Tourist Park. 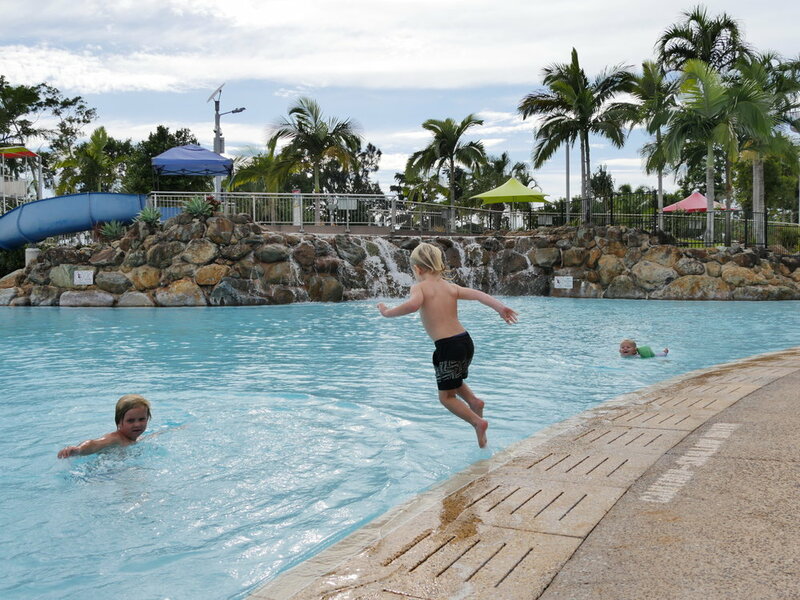 After arriving in the infectious atmosphere of Airlie Beach we check-in to Discovery Parks Airlie Beach. 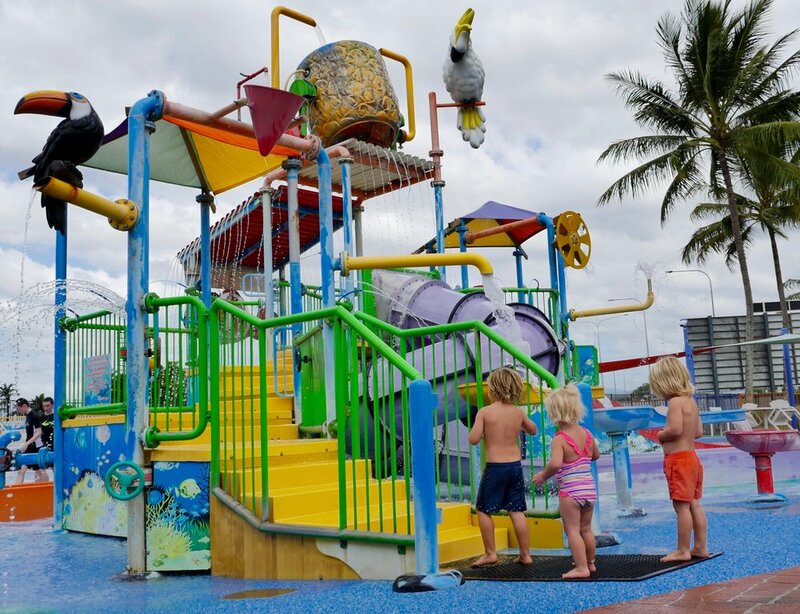 This parks oozes family friendly with a jumping pillow, playground, pool and water park. They provide Pancake Breakfast, Bird Feeding a games room and easy access to town with a bus stop out the front or a 3km walk. After some time burning some energy on the Jumping Pillow we set off for the lagoon. This free attraction is one of the most popular for visitors and locals with views across to the islands. The salt water lagoon is surrounded by landscaped gardens and palm trees and is a great place to relax and let the kids swim. A shallow area suitable for kids lies right beside a modern playground. An early start for our tour transfer to Port of Airlie where we board Cruise Whitsundays vessel for a day on Hamilton Island. A schmick operation and we are there in under an hour. 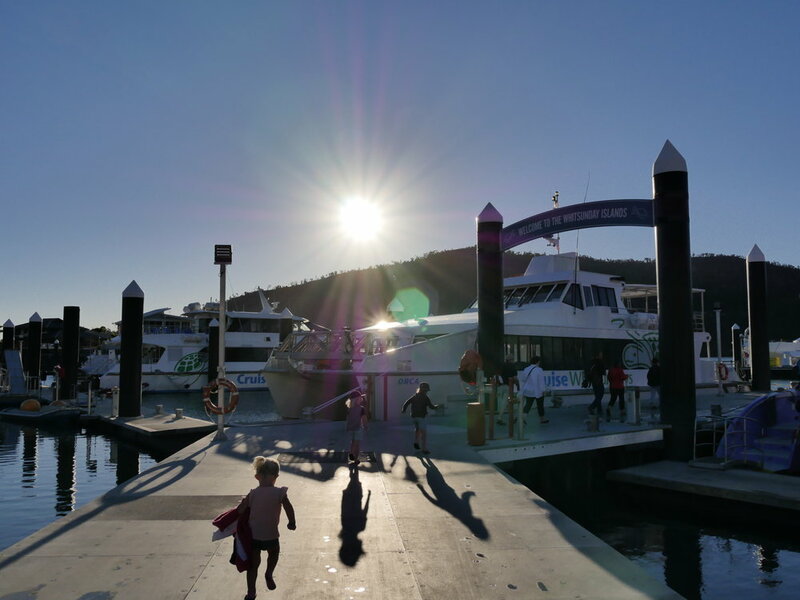 What we love about Hamilton Island is that you can get anywhere on the free coaster buses. We head straight to the resort end for some morning tea and coffee before taking a dip in one of the many pools. A truly beautiful setting, tropical palm trees line the beach, beautiful crystal clear blue water and an opportunity to explore the reef. Our little girl had her day sleep on the sun lounges while we had some lunch and the boys continued to swim. Our afternoon was spent visiting the stunning One Tree Hill. A bus ride up a steep hill and we stopped off for breathtaking views, a must when visiting the island. You can also take in the views while enjoying a cocktail on the deck at One Tree Hill. The day went way to quick and we boarded Cruise Whitsundays for our transfer home. 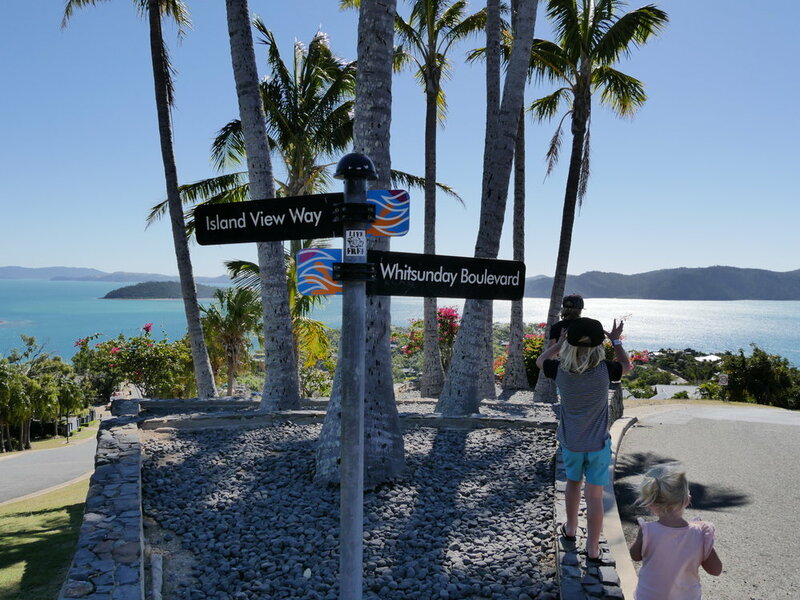 Our next day was spent exploring the local secrets of the Whitsundays. Cedar Creek Falls is about a 30 minute drive from Airlie Beach. Hidden away behind tree and rocks after descending down the short trail it opens up to the tranquility of Cedar Trees, a large rocky wall and a clear swimming hole. Dependant on the time of year, a cascading waterfall will have you engrossed in its natural beauty. Cedar Creek Falls - not running, but still beautiful! These remote beaches, stunning crystal clear waters and relaxed ambeince will have you loving this area! A great place to relax is at the Cape Gloucester Resort. You can access their infinity pool if you purchase a drink at the bar and they also do a great meal too. Lined with palm trees, you have the option of sitting by the beach, or relaxing poolside. 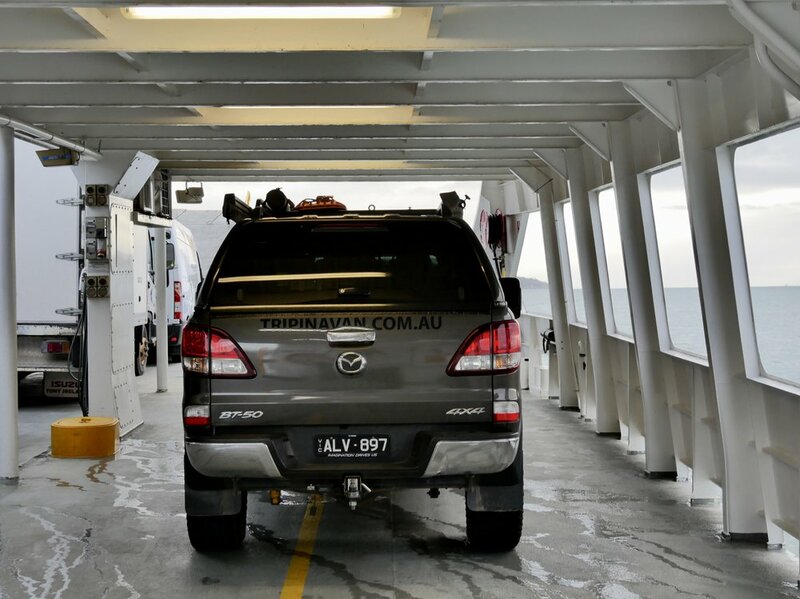 An exhilarating ride through the Whitsunday Islands all in one day! An award winning tour which takes you to the world famous Whitehaven Beach, the stunning Hill Inlet lookout as well as two snorkel spots. NO seasickness for us, as the boat is built and designed for stability and speed. A yummy feed on board and the kids especially loved the fish feeding. 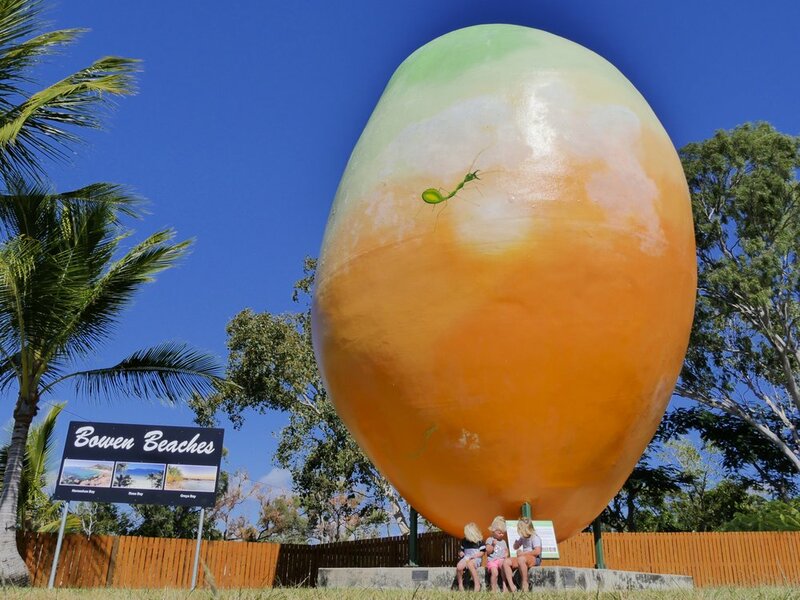 Only a 40 minute drive and you arrive at the infamous Big Mango! You have to stop here for an obligatory pic and to taste the most delicious Mango Sorbet! Here you can stock up on any pamphlets you need and chat to the experts at the Information Centre. Eating delicious Mango Sorbet at The Big Mango. We park up at the Queens Beach Tourist Village and surprised to see we are on a large and lush site! Surrounded by Palm Trees and gorgeous native trees, the park managers do a fantastic job! A pool to keep the kids entertained and they also ride around on their scooters til dinner. A get together with all park guests happen often in this park and we are lucky to experience ‘fish nibbles night’. We eat ourselves sick on the most delicious Mackrel and the kids tuck in too. A great way to spend our night in Bowen. During the day we check out the award winning beaches and by gee they surprise us with their picturesque beauty. Horseshoe Bay, Rose Bay and Grays Bay to name a few! You can even snorkel the fringing reef at some of these beaches. 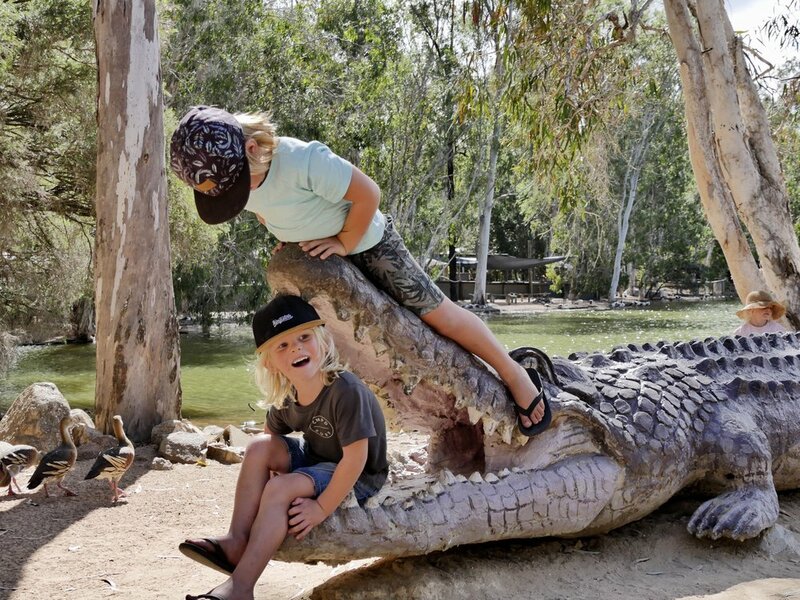 A 2 hour drive and we arrive at the Billabong Sanctuary, which offers Australia’s best interactive Wildlife Experience. 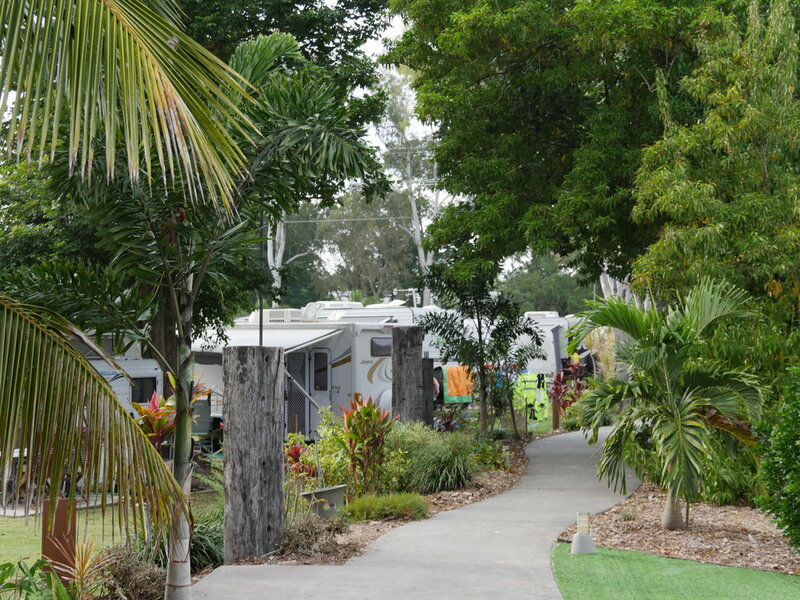 Located 20 minutes south of Townsville, there will be room to park your caravan up at. It features native animals such as Wombats, Koalas, Emu’s, Cassowary, Crocodiles and many more! Our kids really enjoyed feeding the kangaroos by hand and the croc feeding was a hit! After parking our caravan up at the Secura Lifestyle Magnetic Gateway we head to Reef HQ. Reef HQ Great Barrier Reef Aquarium is the worlds largest living coral reef aquarium. Take in the underwater viewing tunnel and spot Nemo and Dory, Sharks and Giant Trevally among others. Plenty of times for tours and feeding throughout the day, it really is an educational and hands on experience. 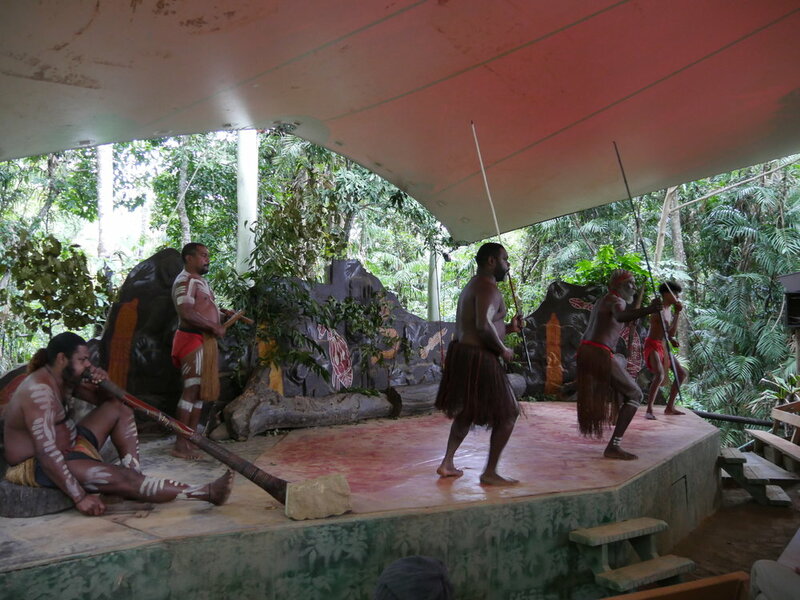 Our next days activities included a trip to the award-winning Museum of Tropical Queensland which provides a snapshot of this diverse region. Very interactive for the kids and they especially loved seeing the dinosaurs come to life, a children’s play area to finish it off and some last minute fun. We spent our afternoon at ‘The Strand’ which is Townsville’s thriving beach foreshore. A relaxing atmosphere with plenty to do, this area will entertain the whole family. Playgrounds, water park, cafe and restaurants with view across to Magnetic Island. Lined with palm trees, its a great spot to take a picnic down or soak up the atmosphere with a BBQ. 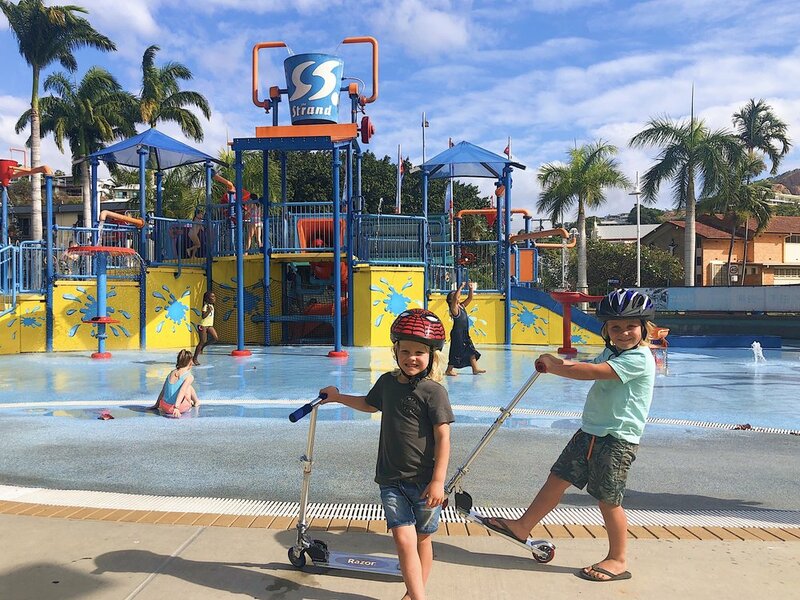 The Strand in Townsville and FREE waterpark! We went West! Approximately 1.5hrs and we pull into the BIG4 Aussie Outback Oasis Holiday Park, we decided to head up to Towers Hill for sunset. With views over Charters Towers and plenty of Rock Wallabies to watch, it made for a beautiful evening. 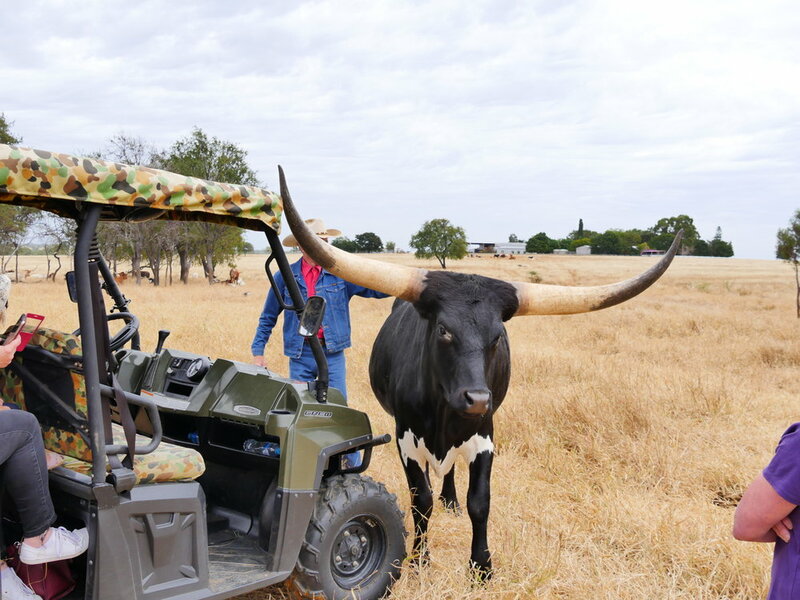 Texas Longhorn Safari is a comfortable tour in an all terrain Polaris Ranger with an intimate experience with Texas Longhorns. 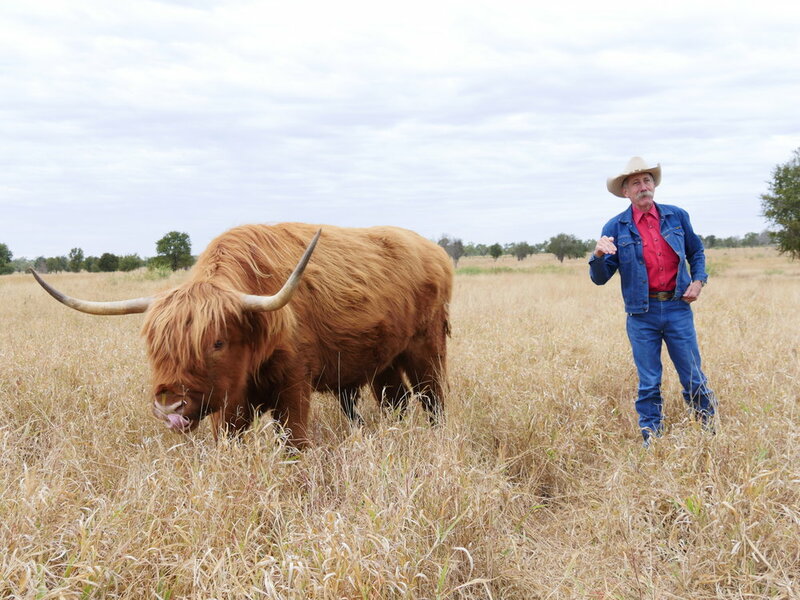 Once back at the Homestead, you can meet the many animals such a Bison, a pet kangaroo, calf and others. The property has some real character and you’ll enjoy walking around it, then finishing off with the most tasty morning tea! Something we would never have done but oh so glad we did!! Fantastic! A short drive back into Charters Towers for some gold panning. The Miners Cottage is an excellent museum for the whole family. Loads of memorabilia and you can have a crack at panning for some gold. The owner Allan is a wealth of knowledge and you’ll be sure to find some gold! Panning for GOLD and we managed to find a fair bit. A fun filled day and we head the 1.5hrs back to Townsville to arrive at Rowes Bay Beachfront Holiday Park for an early night. Up at the crack of dawn to catch the Fantasea Cruising Magnetic Car Barge to Magnetic Island. A 7:10am crossing has us in by 8am to grab a morning coffee from Scallywags. We opt for a pretty relaxing day by checking out some of the stunning Bays around Maggie (as the locals call it) and even do some fishing. Our afternoon was spent at Horeshoe Bay taking in the thrill of the Water Sports and provided much entertainment. A playground there and the main street is lined with cafes, pubs and restaurants. We are on Magnetic Island, so have to try to the local fish and chips and they did not disappoint! Some of the best we’ve had! We hiked the Forts Walk and again, fantastic! Only a 4km round trip to witness amazing views, koalas and some history including the ruins of the Forts that operated in WWII. Another excellent experience to try is on board Aquascene Charters. About a 2.45hr drive to arrive in yet another paradise location, Mission Beach! A trip to Charley’s Chocolate Factory where this unique experience takes you on the journey from “Cocoa Tree to Chocolate Bar”. Learning about how Cocoa is grown and harvested to the makings of chocolate. Although an informative tour, it's not an ideal tour for kids under the age of 5. A 50 minute drive from our stay at the BIG4 Beachcomber Coconut Holiday Resort, is Paronella Park. A castle and a beautiful story, we absolutely loved this place with so much history and well run, we all had a fantastic time. The kids did some fish feeding and ran through the park with their adventuring hats on! They particularly loved the suspension bridge. We stopped in at the cafe for some lunch and the kids had the ‘Big Lunch’ which includes a sandwich, piece of fruit, milkshake or popper, ice cream and a tattoo and sticker… For $7, we thought that was well priced. Hubby and I shared a delicious wrap and had a coffee each. 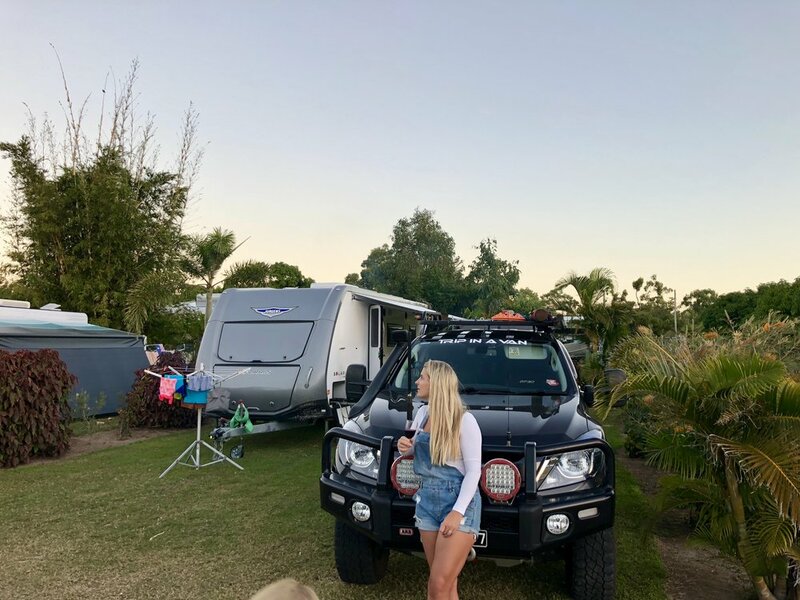 We have heard excellent things about the Paronella Park night tour and it looked amazing, so we would definitely recommend doing that and spending the night in the caravan park out there also! After returning to the BIG4 Beachcomber Coconut Holiday Park we were very excited to have a Cassowary walk right past our caravan. They live in this area and the rainforest surrounding, so you have a great chance at seeing one! read our blog on big4 beachcomber here!! We really are in the Tropics as we hit some pretty bad weather. So we decide to give the Ma Mu Sky Walk a miss due to the rain, however we will be back to do this at some point as it looks excellent! 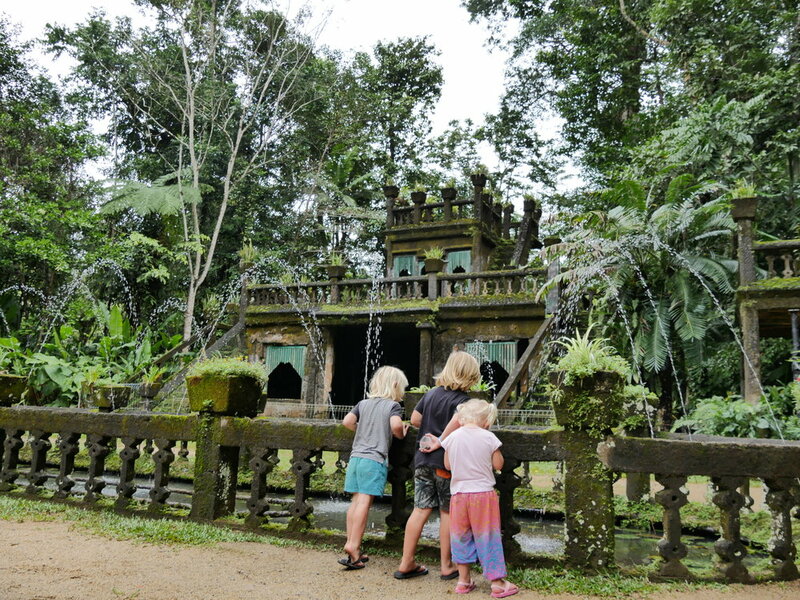 But we keen adventuring on and check out the beautiful Milla Milla Falls. They didn’t disappoint even in bad weather and we were lucky enough to see the water powering over the cliffs edge into the pool below! What a sight and one of the most photographed waterfalls in Australia. We arrive at the beautiful BIG4 Atherton Woodlands Holiday Park and its a well maintained park we are happy is our home fro the next 2 nights. A stop into the Herberton Historical Village for a look back in time and how fantastic it was! We loved teaching the kids about all the old school artefacts from a bygone era. A great historical experience soaking up the Atherton Tableland's rich heritage. After a pitstop for lunch we explored the ripper The Crystal Caves for an interactive experience. It's not like any other cave you've seen before as you can touch and feel everything. So it's an excellent self-guided tour for the kids. The kids had the opportunity to crack a Geode and we couldn't believe the excitement on their faces. Also a passionate man who owns Crystal Caves and his story of gathering gemstones and fossils etc is amazing. A stop in at the heritage-listed Curtain Fig tree, which is one of the largest trees in Tropical North Queensland. A well known attraction in the Atherton Tablelands and caravan friendly parking! We head to Mareeba, which is only about half an hour. Its an early start so we are heaps excited to start our day at the Coffee Works Mareeba. We are greeted by there wonderful staff where they bring the kids their milkshakes and some colouring in, while we get started on the coffee tastings. From world coffees to the ones made in Atherton, we started to try most of them and begin to get a real coffee buzz on. The best part is that you can test out the coffees while also taste testing the varieties of chocolate. The coffee museum on site is a fantastic way to see where it all began and cool to see the old school ways of making a brew. Definitely not a place to just stop in and grab a takeaway (although you can) as it really is a great experience and an all round excellent morning. Another 25 minutes and we arrive in the gorgeous village of Kuranda. If you can, get here early as there is plenty to see and do. Our first stop is the Butterfly Sanctuary, with over 2000 butterflies you’re very likely to have one land on you! Pretty cool to see all the beautiful colours fluttering around. The Rainforestation Nature Park was absolutely fantastic! We started off in the Wildlife Park feeding kangaroos and wallabies, watching Tasmanian Devils and gawking at Koalas from the elevated boardwalk. 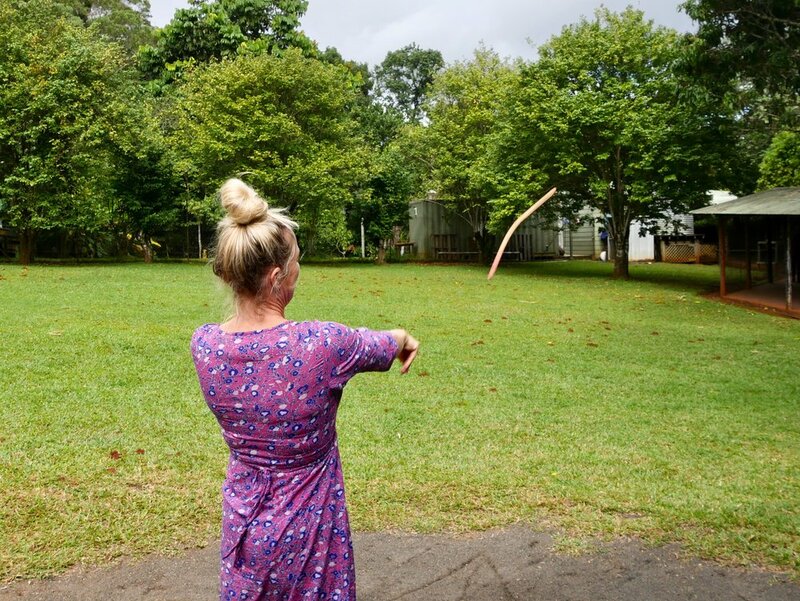 To top it off we watched a fabulous performance from Indigenous Australians depicting traditional dance and had a hand at trying the didgeridoo, boomerang throwing and also observed some spear throwing. Next up was a ride in the awesome Army Duck, an amphibious World War II Duck which toured the property where we spotted plenty of fruits, turtles and birds. After making our way down the Kuranda Range we pulled into Ingenia Holidays Cairns Coconut Resort and WOW. This is seriously a kids haven! Where do we start - Jumping Pillow, massive playground, Games Room, Splash Park, Waterslides, several pools, buggy carts, indoor playground and for the parents - entertained kids haha. Ok, so theres an outdoor cinema, happy hours, electric BBQ’s, Mini Golf, loads of kids activities from face painting, pancake brekky and water aerobics PLUS if you need to burn off all the wine and cheese, they also have a gym! Safe to say we are very excited to be spending the next few nights here! There is so much to see and do in Cairns and we are excited to visit the Cairns Zoom and Wildlife Dome. It’s a challenge ropes course in a wildlife park - how cool is that! We cuddle a koala and enjoyed an interactive reptile show, I (Bec) also experienced the Mid-ZOOM and Hi-ZOOM as well as zip lined over a 4 metre salt water crocodile. The power jump and dome walk was an absolute highlight and got the adrenalin rushing! A fantastic experience! After some lunch, we head for the Marina to catch some dinner! On board a self guided pontoon boat with Bad Fishy who also provided the fishing gear, a relaxing afternoon on the water. Our last night on the Great Barrier Reef drive commences at Cairns Coconut, reflecting on the unreal adventures we’ve had over the last three and a half weeks while feasting at the cafe within the park. IF you are staying here give their pizza's a go! For more great info & a quick guide on the Great Barrier Reef drive, click below. We just completed a 4 week itinerary from Brisbane to Cairns exploring lots along the way. Check out the highlights vid and get planning, it's a must do trip! !